We've brought you news of old airplanes reincarnated into hotels and homes, but until now, we'd never seen a plane turned into an eatery before. That's why we were so impressed (and saddened) by this unique 747 restaurant. 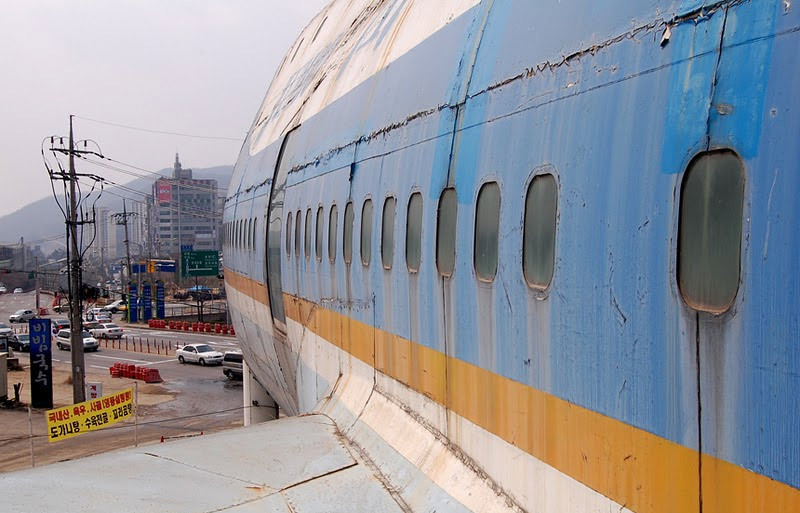 Located in Suwon, Korea, the dining establishment is made of the second Boeing 747 ever made - and apparently the first to be flown commercially - but now sits wasting away with no customers in sight! We can't imagine why people wouldn't be enticed to enter and eat in this historical behemoth (maybe the food was sub-par?) but either way, click through our gallery filled with pics from author Jon Dunbar, who visited the space himself, to catch a glimpse of the inside. On the plane’s interior, the cockpit has been turned into a lofty seating space with a great view. While the restaurant apparently hasn’t been in commission for quite a while now, the tables, seats and even the typical bar trinkets remain. The plane even has what looks to be its original landing gear. If anybody reading this lives near Suwon and knows a thing or two about the restaurant business, please consider taking on this abandoned restaurant and whipping it back into shape! 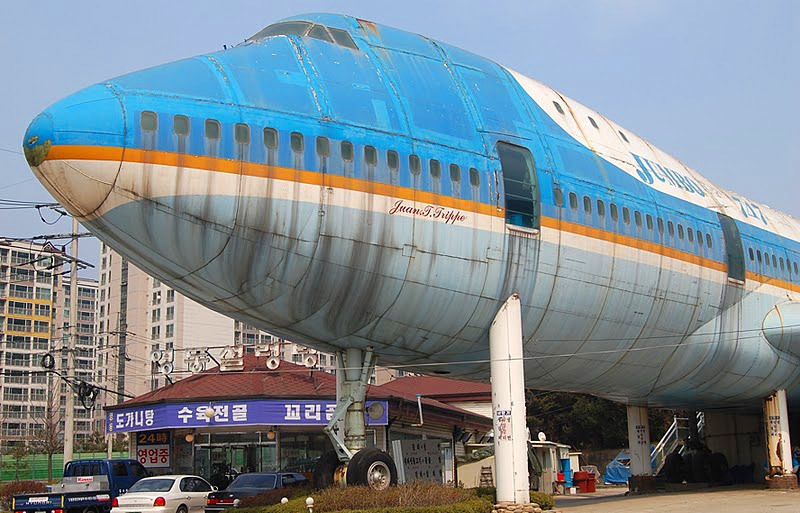 That Airplane-Restaurant isn\'t located in suwon, it is located in Nam-Yang Ju City. While the restaurant apparently hasn't been in commission for quite a while now, all of the tables and seats are still there. On the plane's interior, the cockpit has been turned into a lofty seating space with a great view. Even the typical bar trinkets remain. The plane even has what looks to be its original landing gear. An almost full body view of the plane. Imagine driving down the road and seeing this? We'd definitely stop in for a bite! Signs of disrepair and neglect. The plane sits atop a tiny building adorned with Pikachus. You can't say that the owners didn't try to add some class to the place. If anybody reading this lives near Suwon and knows a thing or two about the restaurant business, please consider taking on this abandoned restaurant and whipping it back into shape!